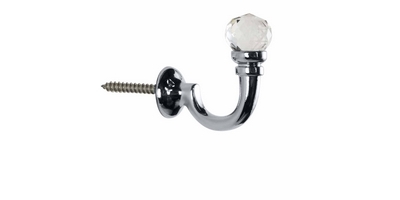 These sophisticated Neo Premium tie-back hooks co-ordinate with the Neo range of 19mm, 28mm and 35mm curtain poles. They make an elegant hook for holding your curtain tie-backs. Please note that these tie-back hooks come in a pack of 2. Holdback Text: An elegant pair of tie-back hooks to co-ordinate with the Rolls Neo range of curtain poles. Sold in packs of 2.